Lines of riot police officers were shoving protesters down Tverskaya street and arresting people on Pushkin Square. Yet the crowd, largely teens and 20-somethings, kept surging forward toward the action, chanting, “Putin is a thief!” and “Russia will be free!” Thousands had come out on Monday for an anti-corruption protest called by Alexei Navalny, who wants to challenge Vladimir Putin for the presidency next year. Cheers went up as young men scrambled up onto balconies and roofs to wave Russian flags. The contrast between them and the crowd at the other end of Tverskaya, where a historical reenactment festival was being held, could hardly have been greater. Middle-aged couples and families with children watched men in helmets and chain mail swing swords at each other. Potbellied men dressed as secret police pretended to detain bandits from a famous Soviet film, oblivious to the very real arrests being done by real police a block away. They quickly departed when police swept the street, unlike the many boisterous young people willing to risk arrest. The protest showed that the anti-corruption march that Navalny had called on March 26, when more than 1,000 people were detained, including me and other journalists, was not a one-off. He has solidified his image as the opposition’s main leader and Putin’s main nemesis. And his growing support comes from Russia’s youth. On Tuesday, Vladimir Putin’s spokesman denied that such demonstrations posed a danger to the Kremlin. He may be right. The president’s approval rating has not dipped below 80 percent since Russia annexed Crimea in 2014. A poll by the independent Levada Center in May found that if the election were held tomorrow, 63 percent would vote for Putin and just 2 percent would vote for Navalny. Given these numbers, the protests this spring may seem insignificant. In fact, they point to cracks appearing in the system that has crystallized under Putin. The regime is built on two bulwarks: faux opposition to lend legitimacy to the political process, and state television to spin the news in the Kremlin’s favor. These are both crumbling with age, as Navalny has revealed this spring. The government often seems to be playing by outdated tactics even though the game has evolved. Police reacted to the June 12 demonstration with arrests, detaining more than 800 people in Moscow and more than 600 in St. Petersburg. But the fact that the second protest happened at all showed that this measure has failed to broadly intimidate protesters and only strengthens their resolve. “The road to revolution is always paved by the authorities, not the opposition,” historian Valery Solovei wrote on Snob.ru, remarking on the rough arrests he saw on June 12. 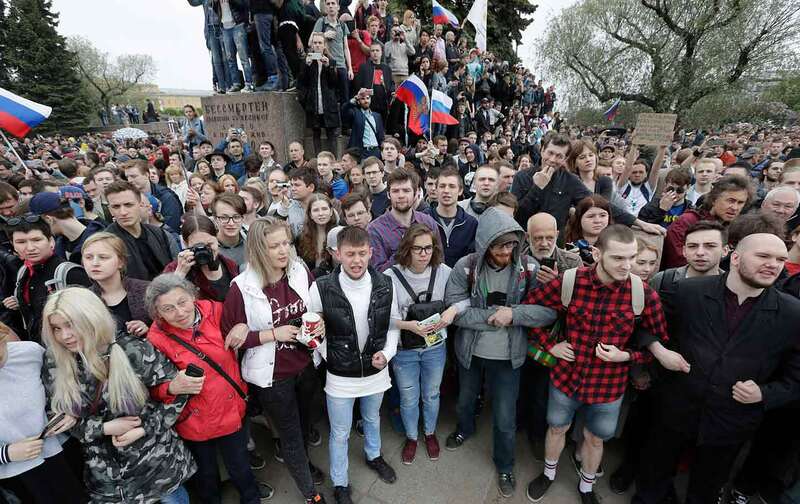 These are not the first large opposition protests in Russia, since tens of thousands repeatedly took to the streets against election fraud over the course of 2011 and 2012. But while those rallies centered on Moscow, the protests this spring were more widely distributed throughout Russia. Protests took place in almost 150 cities across the country, even in remote outposts like Yakutsk and Norilsk. Opposition politics, long derided as a phenomenon confined to the urbane capital, has truly spread to the regions, the bedrock of Putin’s support. And while the 2011-12 protests were driven largely by people with jobs and families, the core of this movement is students, even high-schoolers. In Moscow on Monday, a whopping 136 of the 800-some detained were 18 years old or younger, kids who have no memory of any other national leader besides Putin. I’ve spent much of the past month talking to students who came out for the first time on March 26. It is not necessarily a more liberal generation: Several praised Navalny’s nationalistic stances, such as a pledge to end visa-free travel for the Central Asian migrants that underpin much of the Russian economy. And Putin’s approval rating is 88 percent among 18- to 24-year-olds, largely because they are ill-informed and unlikely to know other politicians, according to Denis Volkov of the Levada Center. But the younger generation does seem to have more protest potential. For them, the repressions of the Soviet era and the poverty of the 1990s are distant history, and as a result they are ready to make bolder demands of their government than their elders, with less fear of repercussions. Although state television remains the main source of information for the population as a whole, the teens and 20-somethings I spoke to all got their news from social-media pages and video-bloggers. This marks a huge shift. One of the first things Putin did to consolidate his power was bring the national news channels under state control, and since then they have peddled a version of events friendly to the Kremlin. But what use is that when Navalny, who is blacklisted from state television, can reach new viewers through YouTube? Like most of the students I spoke to, Olga’s political coming of age was sparked by the video Navalny made about his Anti-Corruption Foundation’s investigation into Dmitry Medvedev, which alleged that the prime minister owned real estate beyond his means, including a mansion given to him by one of Russia’s richest men. The Medvedev video was viewed more than 22 million times. Navalny told me last month his tactic was simply to put enough pressure on the Kremlin that it is forced to allow him to participate in the presidential election next year, even though electoral officials have said a controversial embezzlement conviction against him precludes him from running. He has already been making stump speeches and opening campaign headquarters as far away as Novosibirsk. “They will register me only if they understand…that they are obligated to register me, that there can’t be any election without my participation,” Navalny said. It’s almost impossible to imagine the activist on the ballot with Putin, and yet, after these two huge protests, many will be asking questions if he is not.